At the heart of this 16-acre coffee plantation lies a hacienda-style inn with just a few Coffee Cottages and a handful of welcoming rooms and suites, plus enough character to plant you firmly in the local culture. 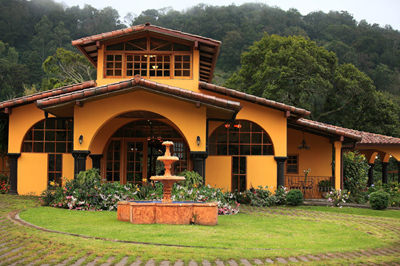 In another era, this was the private hacienda of a thriving coffee plantation. Today, it's an inviting and gracious retreat that has opened its doors to welcome you to the tranquility and seclusion of this idyllic setting. Located at 4,000 feet above sea level in a mystical valley of cloud forest and lush mountainsides, with magnificent views of Panama's only volcano in the distance, the Inn offers quiet and cozy nooks for times of personal reflection as well as opportunities for boisterous thrills and adventure in the surrounding countryside. If you're slow to get started (and who would blame you, you're on vacation), begin your day with a delicious breakfast and some quiet time on the terrace. Later, jump-start the day's activities with a cup of the Inn's own gourmet Los Establos coffee and an invigorating hike to lost waterfalls or a whitewater rafting adventure. By all means, explore the nearby town of Boquete, called the "Little Switzerland of Central America" for its charming architecture and flower-filled hillsides. Seek out some of its unique ethnic restaurants and tour nearby Paradise Gardens, home to a variety of monkeys and the largest butterfly sanctuary in Panama. But guaranteed, you'll be more than happy to return to Los Establos each evening for a relaxing nightcap and a comfortable night's sleep, with only the sounds of the rainforest for company.